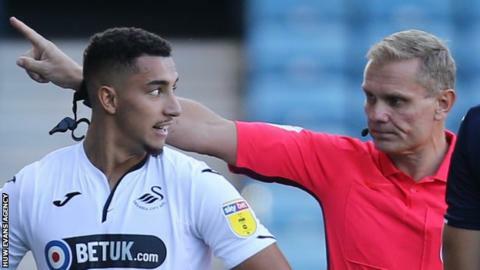 Swansea City striker Courtney Baker-Richardson says he has proved doubters wrong by scoring on his return from suspension after being shown a red card on his Championship debut. The 22-year-old scored Swans' opener as they beat Queens Park Rangers 3-0 at the Liberty Stadium on Saturday. Baker-Richardson was sent off for a dangerous tackle on his first league start, away at Millwall on 1 September. "There's been a lot of sleepless nights, I'm not going to lie." he said. "Only four minutes on the pitch is not a good reflection of myself and what I do, there was no malice in the tackle [against Millwall]. "It was just trying my hardest and trying to impress, but I said I was going to dust myself off and learn from it and come back stronger. "I feel like I've done that and proved a lot of people wrong so I'm very happy with myself." Baker-Richardson played for Swansea Under-23s after arriving from Leamington in August, 2017 and is among the young players to benefit from the club's transfer market activity last summer. After the win over QPR, manager Graham Potter praised Baker-Richardson, saying: "Courtney has different attributes to our other players and he had a bit of a thankless task, but he opened up some space for Oli McBurnie and he did everything asked of him. "I was pleased he stayed on the field longer than the five minutes he did before he was sent off at Millwall." Now Baker-Richardson says he hopes for many more goals, starting at Wigan Athletic on Tuesday, 2 October. If so Baker-Richardson believes he will have proven a point to former critics, including some of his ex-managers. "Once you take the confidence from the first one, you can avalanche into a goal spree so touch wood, it goes that way for me," Baker-Richardson said. "I spent three years in the lower leagues. A lot of managers in the lower leagues said I wasn't good enough. "Every time I told them 'alright, watch this' and every time I've ended up coming on the up. "So whenever someone says 'oh you can't do it' that just motivates me to go and prove them wrong. "I made a lot of sacrifices and a lot of Ls [losses] which I've turned into Ws [wins]. "From that aspect, I take great motivation from people who doubt me." "It just didn't turn out like that. He just patted me on the head and all the players got behind me," said the player. "It was great to see such team spirit within the camp, because a lot of teams, more likely the older players sometimes give you a good talking to, but everyone was behind me 100%; it was just dust yourself off like I did against QPR. It shows great spirit in the camp." Baker-Richardson said his goal against QPR was "very special" for him, but he did not see his hooked shot go in. "I was sort-of on the spin so it was like left foot, and I just saw it drop and I thought 'Oh, I'd better start running to the corner flag'. "It was a surreal moment for me. "I mean two seasons ago I was playing in non-leagues, lower than the Conference level [fifth-tier National League] with Leamington, so I have a lot of grace and praise for the people who have helped me along the way and got me to where I am today." Baker-Richardson now hopes to help the Welsh club return to the Premier League after relegation last season. "Every young boy's dream is to play in the Premier League," he said. "If we can manage to get back in the Premier League under Graham Potter with this squad, it would be one of the best moments in [the club's] history. "A lot of players have left - a lot of big players - and we've come with a young squad into the Championship. "We don't look like we're going to go down and from our aspect, we don't look like we're going to lose a game. We're just think win, win, win, win, win."